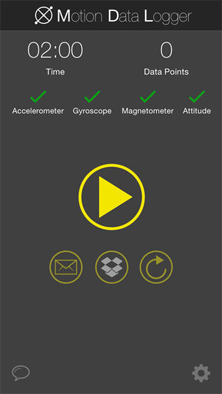 Record standard gravitational acceleration of your device in directions x, y and z. Record rotation of your device in dimensions x, y and z in radians per second. Record the magnetic field in dimensions x, y and z in microteslas. Export your collected data to one or multiple CSV files including headers, timestamps and all sensory data. Connect your personal Dropbox account and save your exported data right away in the cloud without a hassle. Share your recordings with others in your team by sending them your results by email. They will receive your sensor data in form of CSV files too. How can I change the sampling rate? 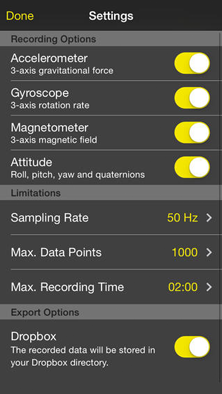 Enter the settings page of Motion Data Logger and select your preferred sampling rate. This rate will be used to set the update rate of the hardware sensors. However it can not be guaranteed that sensor data will be delivered to the app in that exact sampling rate. Which tools can I use for analysis? Due to the mostly supported CSV file format you can use a wide range of tools to analyze your collected sensor data. It is easy as pie to import the data to Microsoft Excel, Apple Pages or even R.
How do I connect my Dropbox account? Open the settings page of Motion Data Logger and tap on Dropbox. Now you need to authenticate via Dropbox with your login credentials and confirm the permission for Motion Data Logger to write to your Dropbox. Motion Data Logger will only write to a app-specific folder in your Dropbox and not able to enter any other files or folders. Can I lock my phone during recording? Yes, you can lock your phone during the recording without any data loss. The app will collect the data in background until you stop it, the time limit or data points limit have met. How can I start another recording? After finishing a recording you have the option to send your collected data via email or to store it at your Dropbox account. If you want to start a new recording, just tap the reset button at the right and you are ready to go. We’d love to hear from you. 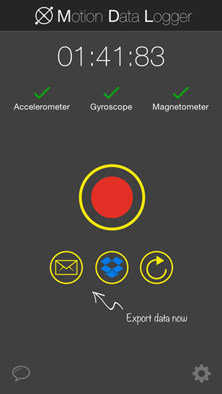 If you have any questions regarding Motion Data Logger or requests for features you would love to see in our app, please do not hesitate to contact us.